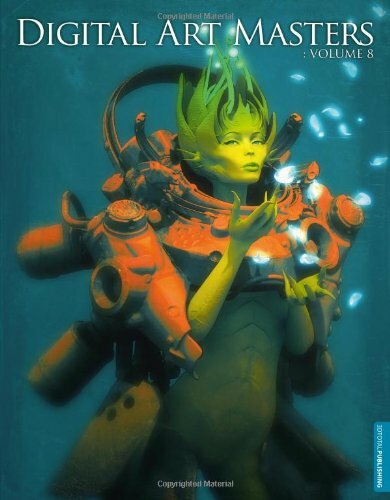 This is another insightful volume for the Digital Art Masters series. 50 artists are included and each one walks you through the process on how they created their artwork. There are examples from different styles of art, such as 3D, landscape, concept art, character designs, etc. It's illuminating to see and read about how the work evolves at each step of the workflow. The artworks included as wonderful. Siamak Roshani, winner for the Portrait (Rendered) category in EXPOSE 11, also has a tutorial here. Other notable pieces would be the one with angel and death playing cards over someone else's deathbed by Hu Zheng and the hyper realistic 3D render of Bruce Lee by Alexander Beim. There are several sci-fi themed pieces with robots, mechas, spaceships and aliens. It's very impressive showcase of work all around. The book has 288 pages instead of the 320 that Amazon has listed wrongly. Highly recommended to digital artists.